DaddyGregor sent this to me and I couldn't have said it better myself…so I didn't. If you come to my door on a 90-degree day, sweaty from peddling your white-shirted, black-trousered self all around my 'hood, and ask me where god is in my life, I am likely to say, "which one?" Then, if you think I am a polytheist, I will take you on a road through the ins and outs of my multiple lives as a polygamist (just like your Mormon grandfather, perhaps…). Conversely, if you guess that I in fact already lead multiple lives, I correct you and then expound upon the various gods of Norse mythology and how I feel them acting in my day-to-day life. Why? Because religion is a personal thing and you are a complete stranger. So, if I am hardly likely to be swayed in my beliefs at this point, even by a close friend, it's a waste of my time for you to go a-working on my soul. And if anyone is gonna waste my time, then I'm gonna be driving, be it the car or the conversation. It makes no difference to me. Here's the deal: I pretty much consider it an invasion of my privacy for you to come to my door talking about personal matters. I don't welcome home improvement people, people who want to garden for me, realtors, or any other stranger at my door, why would I want to talk to a stranger about imaginary beings? It's the height of arrogance for them to assume anyone else cares about their calling! If I could afford a bouncer, I'd have one. And it's not because I'm a mean or unhappy person. It's because some people just have no boundaries. 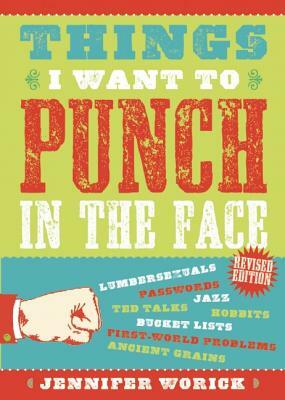 I wish this was titled "People Who Knock on My Door and want to talk religion". I only say this because my 13 year old son, under the label "Missionary", has given up his summer to rebuild villages in Samoa that were devastated by Tsunamis. He isn't knocking on people's doors and shoving his religion down people's throats (We hate that too), but he's serving and caring for the less fortunate than him because he believes in something greater than him. Stephanie: excellent point! Your son sounds like quite a guy. I'm with Stephanie. Yay for (servant) missionaries. Boo for (harassment) missionaries! Yeah, there's a difference between the Jesuit(Jesus Christ of Latter Day Saints) "missionaries", and other kinds. The kinds that dress up and knock on your door do that because their church encourages them to spread their religon, because they believe they are earning "points" toward heaven. People like Stephanie's son do it out of brotherly love for others and often partner missions with acts of service, like building and feeding people. I've been to several mission trips, in the los angeles area, in the Dominican Republic, and Mexico. just saying...don't want to start a theological argument here. The guys pictured prolly have a helluva farmer's tan. If the attractive one showed up wearing only a pair of cargo shorts, I might hire him to mow the yard. Just fyi as a slight clarification above......... Jesuits are NOT Jesus Christ of Latter Day Saints. Jesuits are Catholic and they don't go knocking on doors! Just wanted to clarify. Very interesting! I agree about anyone coming to my door....not my favorite. Also agree with the point about "missionaries" and love Rhonda's comment. "Yay for (servant) missionaries. 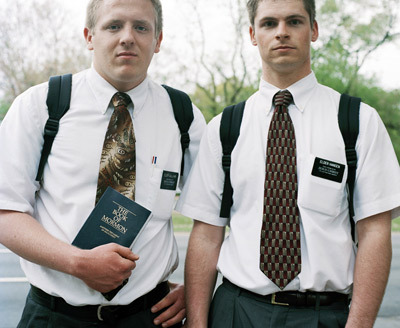 Boo for (harassment) missionaries!" No one is gonna win anyone over to their cause by harassing (ie: knocking on my door and forcing me to listen, or forcing me to feel rude by shutting the door and saying no thank you!). Political, religious, etc. Just curious, do you suggest they stand on a corner and share with anyone who will stop? I don't think I would, nor will I stand at my door very long. Where should people who are "called" share what they feel so strongly about? Two young ladies showed up at my door (haven't seen female Mormons going door to door before today)and wanted to talk. Besides the obvious invasion of privacy on my otherwise very happily unproductive off-day, they wouldn't answer any of my questions and in fact, DENIED that Mormons had any role in the Proposition 8 fiasco in California. I told them that I viewed them as the enemy and that as far as I'm concerned, I longed for a day when the government would strip their tax exempt status. I served as a missionary of the Church of Jesus Christ of Latter-day Saints in Long Beach, California. I don't believe that I will get some determined set of points in heaven for my service, but I gained eternal relationships with the people I helped. Was I happy about people getting baptized, recieving the Holy Ghost, and choosing to follow Jesus Christ all of their lives? Yes! I do it because I know that God loves me and I want others to feel God's love too. Before you critize any religious person, think of all the positive externalities it has in your community. Why don't you ask the missionaries for help? I know they would love to help even if you didn't become a member. All I am asking is to remember that the missionaries are not out there for reward, they are there to help. If you don't want to speak with them, nicely tell them that you are not interested in learning about our church and you don't need their help. If you are that specific in nicely rejecting them, they will not have much to say and they will leave you alone.